A long time ago, we had a shower curtain. We bought it at Kmart, to use in the bathroom of the very first apartment we ever lived in together. The curtain was white, with multi-colored vertical stripes of varying widths. The pattern was called "Cabana Stripe," and it had a decidedly beachy feel. It was a Martha Stewart product, which was saying something: at the time, in the era before she was a convicted felon, before she had risen again like the mythical phoenix, you could only buy her stuff at Kmart and it was the most expensive brand they sold. Buying her shower curtain made me feel put-together, full of Martha-ness, rife with unimpeachable style. It was a pretty shower curtain. I chose it because it seemed like it would brighten up the bathroom, or at least make it more liveable. The entire bathroom was done in sky blue: four-inch tiles over the floor and three-quarters of the way up the walls, matching bathtub, sink and toilet. The undersink cabinet was battered, dark wood. There was no window. There was no fan, either, and the bathroom was perpetually damp. New mold spots appeared daily like mushrooms after a rainy spell. The floor of the bathtub was in bad condition, the porcelain finish worn away so that dirt stayed embedded in the surface and it was dangerously slippery. Undaunted, I hung my cheery Cabana Stripe curtain, added nautical-themed decor I bought at the Christmas Tree Shoppe and pretended it was a nice bathroom, not a moist, cerulean cave. I tell this story because I really loved that shower curtain. I was sorry to see it go, several years later when we had bought our first home and realized that the curtain wouldn't work in the 70's-era peach-and-avocado-green bathroom in that house. If you can believe it, this was an even worse bathroom than the one in our apartment, but we eventually gutted it and rebuilt it from the floor joists upward...a horrible tale nobody wants to hear. The Cabana Stripe shower curtain was kind of grungy by now anyway, so it became a painting dropcloth. The prettiest one ever, I think. Anyway, I've always looked back fondly on the shower curtain. It was one of the first things I ever bought for the first place I ever lived outside of my parents' home (aside from dormitories). I felt nostalgic about it for a long time. It was with this illustrious shower curtain in mind that I began a stashbuster crochet project while we were on our vacation to Colorado in June. I had a lot of worsted-weight acrylic yarn scraps left over from various early crochet projects. I'm still using acrylic for blankets but I've switched to Stylecraft Special DK which is so much nicer to work with. The scraps were from several different brands, including Vanna's Choice, Red Heart, I Love This Yarn and Caron. The color I had the most of was very similar to the sky blue of the bathroom and the same color was also in the shower curtain, so I decided to try to replicate the look of the shower curtain in my throw. Silly? Maybe. But I like stripes and bright colors and I really wanted to use up the last bits of that yarn - my learning yarn, the yarn I fought with and cried about and gritted my teeth over as I tried to become a better crocheter last year. Now it's a cute, colorful throw blanket for my living room. You wouldn't be wrong if you said this looks a bit like a TV test pattern. But I like it. There are so many colors and they seem to work well together. That main sky blue is the one that reminds me of the old bathroom. It was slightly scratchy, squeaky Red Heart Super Saver yarn and I didn't like working with it very much but it was the skein I used to teach myself how to crochet in the round. The shower curtain had a lot more white than my blanket does; I only had a small amount of cream Vanna's Choice to use, but I think I achieved a similar effect. The whole blanket is done in hdc stitch, which is my favorite stitch for long rows. I think it makes a nicely-textured fabric. The crocheting went very quickly. I worked in the car on our trip and in the evenings in our vacation rental. Back at home, I worked on it mostly in the evenings. I just made row after row of hdc, with ch2 for turning at the end of each row. The edging is two rounds of hdc, first in a mossy green and then in the main blue. The corners are a basic corner stitch combination - 2hdc, ch2, 2hdc. Simple and easy. I did the stripes in a random color pattern and varied the width of the stripes somewhat randomly too, but also had to work with the amount of yarn I had in each color. I had much more of some colors than others. But they all got used and there was only a little leftover in the end. The stripes are anywhere from 1 to 5 rows wide. I decided to use it to spruce up a camel-colored club chair in the living room. This room is already the seat of much craftiness, including pillows, another afghan and quilted table decor I have made, but I don't think you can have too much of this stuff. It makes me happy to create it and to see it there every day. Now this little throw can brighten up the chair and be at the ready when the weather cools down. Started mid-June, finished first week of July. This is all that's left of the yarn; it used to fill my Attic 24-inspired yarn bag right to the top, and now it all fits inside a plastic blueberry carton. We'll keep it for bead-stringing and other art projects. So much lovely colour what a feast for the eyes. This is absolutely gorgeous! So bright and cheerful, really lovely work. I love the story behind it too. Thank you for visiting my blog and leaving a comment. I absolutely love your throw, you'd think you'd bought the colours to go together, they work so well, and I love the fabric that the stitch has created. I'm quite partial to stripes and the different widths work so well together, you've done a great job. If you'd simply told me about this I'd have said surely that won't work with all those colours, but show me and I can see that it not only works it's amazing! I like it too and if you scroll up and down on the images really fast it sort of looks like a TV test pattern but a bright and cheery one! 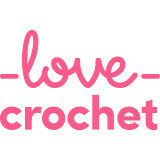 I can't believe that you haven't been crocheting for years and years...so beautiful! Well told story Jennifer and gorgeous bright stripy blanket - lovely compact neat stitching! 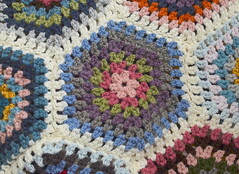 I love all the colours in this blanket, beautifully made, and what an interesting story behind it! That is so fun and cheerful! Great way to use up leftover yarn. Yes, I'm sure Martha would approve -- "It's a good thing." I just love your throw! The colors are so pretty and bright. And it's perfect on your gold chair! I love your throw! I started one with a bubble stitch back in December. Where is it now? In a bag in the closet. You inspired me to bring it back out! Hi Jennifer, I absolutely love your throw!! !It reminds me of candy!! !And when it's rolled up,I almost want to look for the writing inside the candy!! !It's a very happy and cheerful little throw!! !Nicely done!! !You can be very proud and you will always remember the memories of this wonderful little throw!! !Have a wonderful weekend!!!! That is such a good idea. Simple and super effective. Well,done. 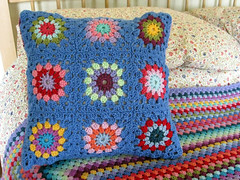 What a lovely colourful blanket, just perfect! Love the story behind the throw- and a very nice one it is too! So very colourful, I bet it brighten up any room. I love the colors, very pretty! How funny that we both decided to make such similar blankets at the same time! I love that you based yours on a shower curtain, I adore the back story! I love your blanket throw. It's bright & beautiful. Makes me smile. I have an Attic 24 bag, too. I'd love it if my stitches were so even...I'll keep trying! You inspiration must have been beautiful! Your throw is great! I sat here thinking maybe I could make something like that. It has been years since I crocheted. I'm sure it would not look anything like yours! That is gorgeous! Love the stripes. That is one happy throw! Love it.